Weather vanes are very good instruments for experiment and play. They tell us the direction of the wind. 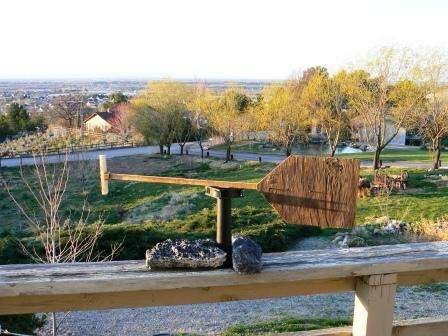 Making weather vanes at home is really simple. You can use items that are present in the kitchen or at your own storage rooms. To make a fun weather vane, try to think of a theme that you can shape so it would look good on your roof top or at your backyard. They can be considered a decorative feature on your home. Weathervanes usually use metal sheets. However, let us create our own by using cardboard and wood. Choose a pattern for your weather vane. It can be a farm animal like a cow or a sheep or other things that are shaped from nature like a whale or dolphin. Draw the object on your cardboard using your pencil. Make it fit to the sizes you want or we can go for about thirty centimeters by twelve centimeters for a start. Cut it out using your heavy duty scissors. Trace the same pattern on another cardboard or wood and cut it out. Staple the two cut outs together at an interval of two inches. Make sure you leave enough space for the broom stick or piece of wood that is thin and long in which the cardboards will be inserted. Use 10” broom stick to be inserted in between the pattern cut outs. Put glue on one side of the stick before placing it in between the patterns. Afterwards, mold the pattern around the stick and let it dry for a few minutes. Once it is dry, you can customize your weather vane by painting it with any color. Play with the colors to create the theme you want. Match it with the color of your roof or the color of your wall. Attach the pattern to the wooden dowel. Place the finished weather vane on your rooftop or on your garden around the flower bed or you can attach it to your mailbox or stair railing. Make sure that the weather vane will move along with the wind. And make sure you secure the construction so that it will not be blown away by a strong wind.